The Anne Bonny and Cairo have teamed up to bring you a second year of Expo: the micro fest of film and music and art in the micro ‘hood of Sleepy Hollow/Top Pot/Summit. 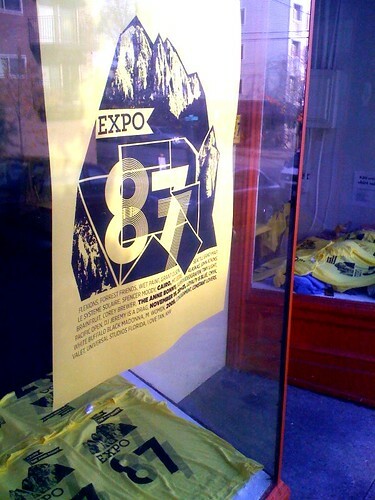 Expo 87 is three nights and includes two film series, more than 20 bands, and one interactive art installation. The film series on Thursday are free; $10 will get you an all-festival pass for all events on both Friday and Saturday. Supervideografen : A series of short animated films co-curated by Sean Pecknold; and Pacific Open – A shorts program comprised of miscellaneous musically driven films from around the Northwest, co-curated by Christian Hansen. Free! Thursday, Cairo 7 – 10pm. CMYK : dance pop band with a fun and bright sound. Friday, Cairo 7pm. Mt. Eerie: Ballad-driven music from a man and his guitar. Of Mt. Eeerie, the NY Times said recently, “The gig was a recollected chronicle of awe, sung in a high, light voice, a little like Will Oldham’s, but clearer and straighter, without its coils and burrs.” Saturday, Cairo 9pm. I’m sure there are more gems in the Expo 87 lineup Check out the full schedule, and feel free to add your own picks in the comments. Getting there: The Anne Bonny and Cairo are located at the corner of Mercer and Summit. Nearest bus lines are 14, 43, and 49. Street parking is very limited. Nearby replenishments: Summit Public House, Toscana Pizzaria, Sun Liquor and Top Pot Donuts are located across the street. A few blocks north and one block west on Bellevue is The Lookout. Snacks and beverages available at mini-mart Summit Foods next to the Anne Bonny.